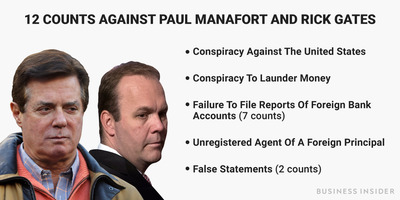 President Donald Trump’s campaign chairman, Paul Manafort, and Manafort’s former business associate Rick Gates were indicted by a grand jury in special counsel Robert Mueller’s probe of Russia’s meddling in the 2016 US election. At the end of a wild Monday, three of President Donald Trump’s associates were indicted on criminal charges. Two pleaded not guilty in federal court, and one pleaded guilty to making false statements to the FBI about his contacts with Russian officials. They were the first indictments in special counsel Robert Mueller’s investigation into Russian meddling in the 2016 US elections, and whether members of the Trump campaign colluded with Moscow. Trump’s campaign chairman, Paul Manafort, and Manafort’s former business associate, Rick Gates, pleaded not guilty after being indicted by a grand jury. The conspiracy charge doesn’t have any direct connection to Mueller’s investigation into whether the Trump campaign colluded with Russia before the 2016 US election. It’s a general charge stemming from any joint effort to defraud the US and is tied to the allegations involving Manafort’s and Gates’ money. Right-wing media seized on this distinction. Many of the president’s allies defended Trump, distancing him from Manafort and counter-programming with negative stories about Democratic leaders. White House press secretary Sarah Huckabee Sanders deflected during Monday’s press briefing, arguing that the indictments didn’t reflect poorly on Trump, and claiming instead that people should be focused on the Clinton campaign’s partial funding of a salacious dossier with negative information about Trump. Top Senate Democrats warned Trump that Congress will take “swift” action if he fires Mueller. White House staff learned about Manafort’s indictment from news alerts right before their morning meeting with chief of staff John Kelly. George Papadopoulos, 30, a foreign-policy adviser to Trump’s campaign in early 2016, secretly pleaded guilty October 5 to making false statements to the FBI about the nature and extent of his contacts with foreign nationals who he knew had ties to senior Russian government officials. The charge was unsealed on Monday. Papadopoulos was apparently told that Moscow had dirt on Hillary Clinton in April 2016, completely changing the timeline of Russia’s election interference. The unsealed court filings showed extensive contact before the election between Papadopoulos and Russia-linked foreign nationals, raising the stakes for the White House — and throwing a huge wrench in Trump’s attempts to distance himself from Manafort. The indictments launched a jam-packed week in politics — social-media companies testify before the Senate Intelligence Committee about Russia accounts on Tuesday, the GOP unveils the details of its tax plan on Wednesday, Trump will likely name his pick for the next Fed chair on Thursday, and the president heads to Asia on Friday. Facebook and Twitter will tell Congress this week that Russia’s election meddling was worse than we first thought. Tony Podesta, the brother of Clinton’s former campaign chairman John Podesta, resigned from his position as the head of his lobbying firm following his inclusion in Mueller’s Russia investigation. Manafort’s indictment alleges that from 2008 to 2014, he used offshore accounts to wire over $US12 million to fund a luxurious lifestyle, paying for items like Range Rovers, men’s clothing, and housekeeping services. Manafort’s indictment also shows he made “thousands of dollars a week” using Airbnb to rent out a $US3 million New York City condo he allegedly bought with offshore funds. Manafort’s wife Kathleen has been a quietly pivotal part of the investigation against him.